First off, I’m sending my thoughts and prayers to those injured in that horrific crash at the DRIVE4COPD 300 on Saturday. As a fan, you never enjoy seeing anyone get hurt, drivers, fans, crew members, or officials. The new Fox GyroCam is amazing! It gives the fan an idea of how insane the banking on these tracks is. I can’t wait for the camera to go to Talladega. 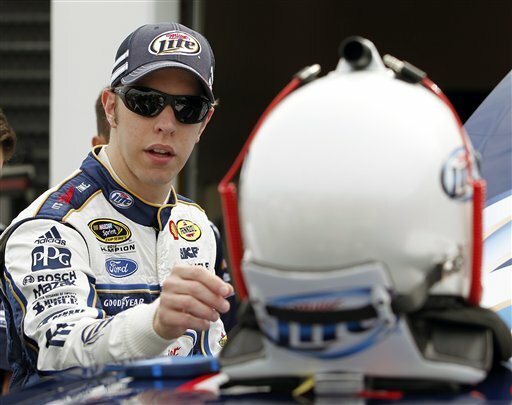 Brad Keselowski debued a rather unattractive white helmet for the 2013 season. The old design, a blue carbon-fiber design with Miller Lite logos look much better in my opinion. Very weird to see Blockbuster Video as a primary sponsor…I thought they went bankrupt. It is clearly a last-minute deal because the color scheme of the car, and the color scheme of Blockbuster aren’t the same. Juan Pablo Montoya was involved in a wreck, and the crew had to tape the car number on the passenger side. The Chevy SS, Ford Fusion, and Toyota Camry, both production and race cars look really good. There does seem to be an issue with the strength of the attachments on the windows, as NASCAR mandated that they be strengthened. I am not a subscriber to the Danica Patrick hype, but what she did this week speaks for itself. Winning the pole position and finishing 8th after a very impressive race performance that was very impressive. And Finally, Congrats to Jimmie Johnson, who won the race in an impressive fashion in one of the best looking cars in the field today. Fox debuted several new cameras, including a revamped zipline camera called the CAMCAT that flies over the track, and a gyroscopic camera that stays level even when the car is on a banking. The new zip line camera is really good, and the gyroscopic camera gives the fan a really good idea of how banked the track really is. The new cars in general look really good, and I was wrong about the names on the windshields. They do look good, and they are easy to see with the in-cars. I don’t approve of the manufacturer logos on windshield on either side of the name though. In addition to the larger roof flaps, the cowl flaps are visibly bigger, and have been moved to the hood. The orange Home Depot back bumper on the Dollar General Toyota driven by Matt Kenseth looks really weird. As does the door design on the Target Chevy. Man! Kevin Harvick’s car looks really good, as does Dale Jr’s! Martin Truex in the Napa Toyota is the most improved paint scheme of the whole field. The cars seem to be sparking more than they did last year. They also look “cleaner” than they did last year. They have cleaner lines and cleaner windshields. Speaking of windshields and windows the side windows need to be attached better. During the wreck, one car lost a side window, and Carl Edwards lost a side window in the final laps of the race. NASCAR needs to look into that. Now on to photo matching. 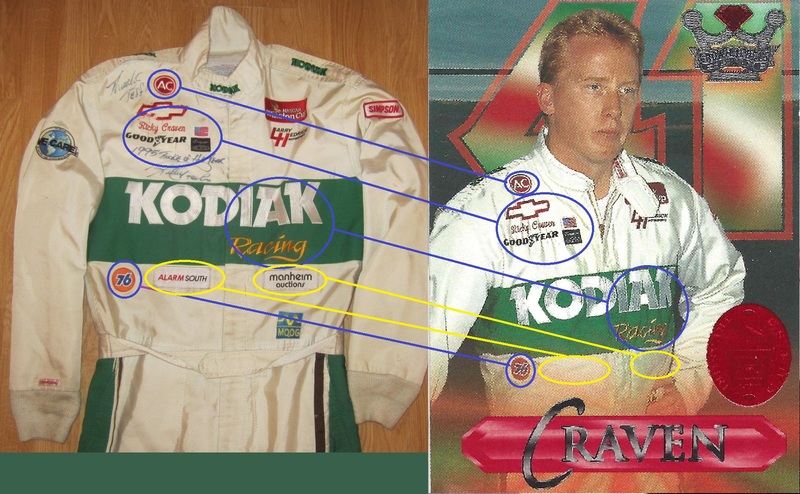 One of the best ways to authenticate a driver suit as having been worn by the driver is to find a photo of the driver wearing the suit. In many instances, this is not possible. 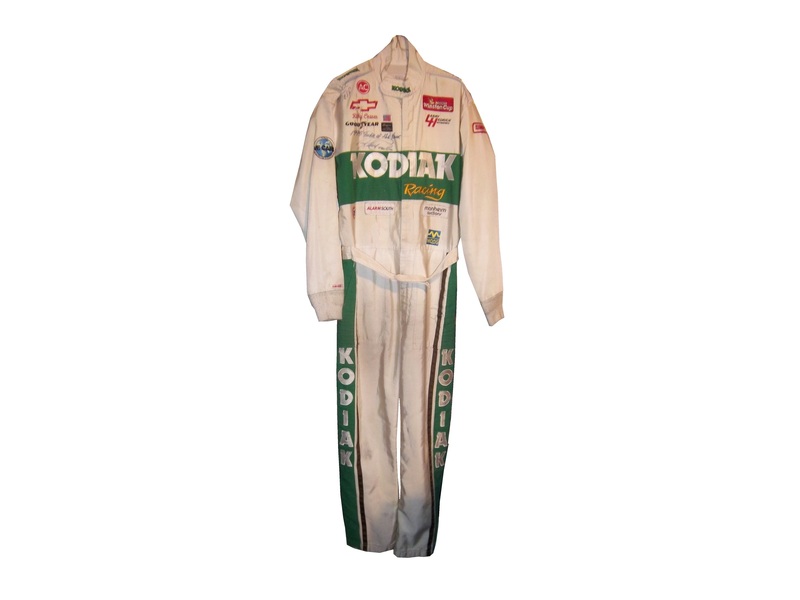 In other instances the driver wears several different suits throughout the season, and finding the exact suit can be difficult. Let’s take a look at a Ricky Craven suit from 1996. This suit was difficult to photo match but I thought I had in this photo from Fuller Motorsports and Collectibles. Upon closer inspection, this suit in the photo and the suit in my collection are not the same. The location of the yellow RACING embroidery is in a different location, the leg stripes in the photo are white whereas the suit I own has green leg stripes…but modifications are not uncommon, and the name and GOODYEAR logos are in different places as well. 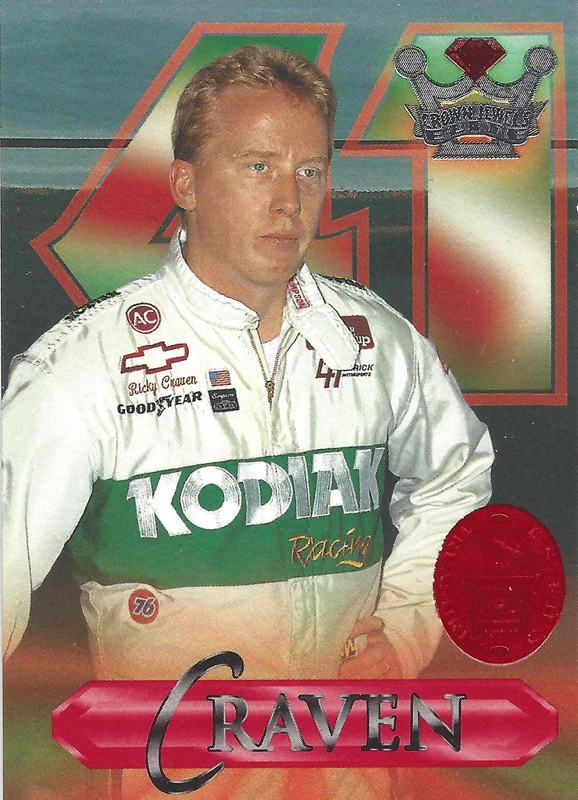 This card is from 1996, and shows Craven clearly wearing the suit in my collection. The RACING, GOODYEAR, and name are all in the correct place. 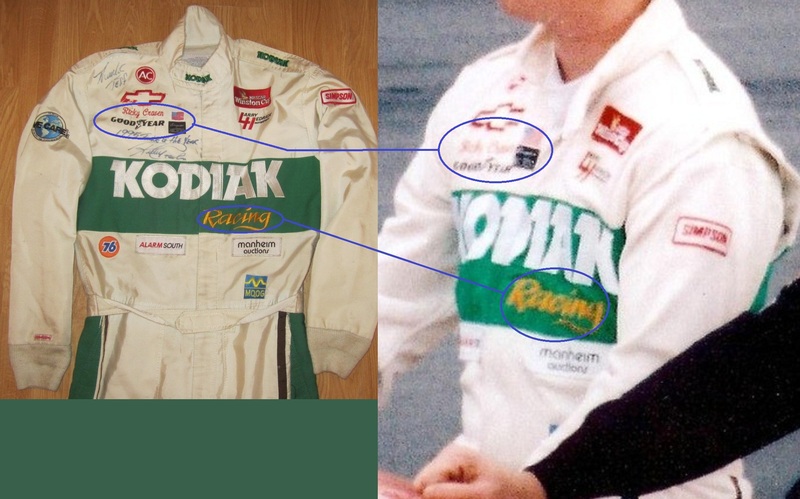 The only difference is that the ALARM SOUTH and MANHEIM AUCTIONS logos are not seen in the card, but on the suit they were clearly added later. They are patches on the suit whereas everything else is embroidered on the suit. John Wes Townley #7 Zaxby’s Toyota Tundra There is nothing right with this design. Everything here is just awful, and earns the F grade it deserves. Brad Keselowski #19 DrawTite/National Watermelon Association/Reese Racing Ford F-Series The Reese and DrawTite schemes are A grades, but the National Watermelon Association scheme gets an A+ for the graphics on the bed of the truck that make it look filled with watermelons..that is just awesome! 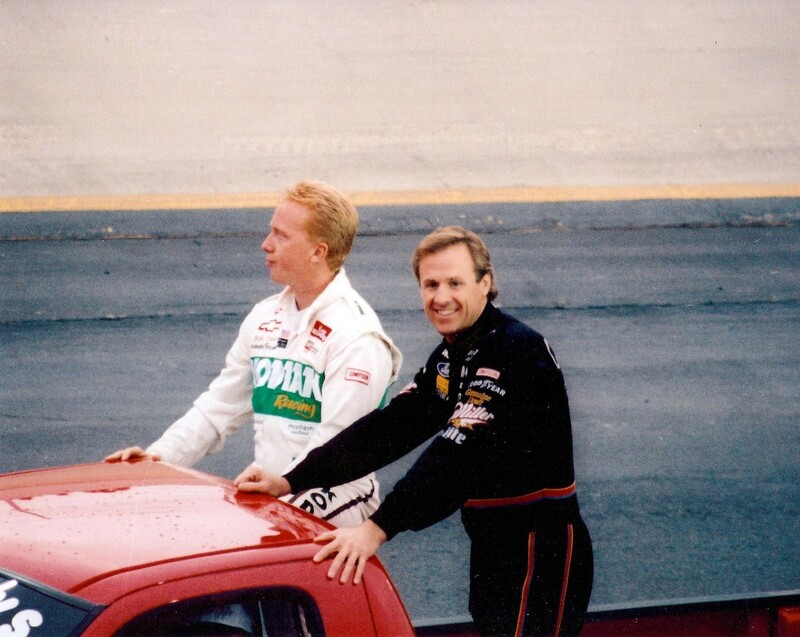 Dave Blaney #7 Sany Chevy SS Great color scheme ruined by bad door design and generic racing number design. The design is just disgusting to look at, and it gets a D- The paint scheme saved it. Kyle Busch #18 Interstate All Battery Center Toyota Camry This is a design that has elemets from the Dale Jarret and Bobby Labonte eras. I love this design! Great color scheme, simple nostalgic design, and it gets an A! Trevor Bayne #21 Motorcraft Quick Lane Ford Fusion This is based on the 1963 Daytona 500 winning car Tiny Lund drove and it looks really good! I can’t give this scheme any lower than an A so I won’t. As I mentioned in the last post, the SFI/FIA Certifications on current helmets are located on the HANS anchors. I also discussed the advancements in helmets over the last 12 years in my post on the evolution of helmets. But what makes the current helmet design so effective? Let’s take a look at one. This example is an Impact! 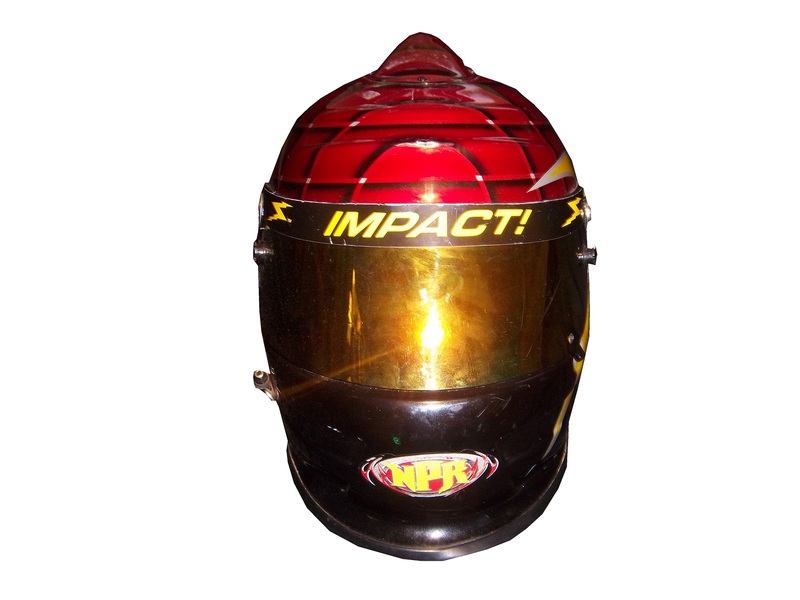 Air Vapor helmet worn by either Regan Smith in 2005 or Jason Keller in 2006. 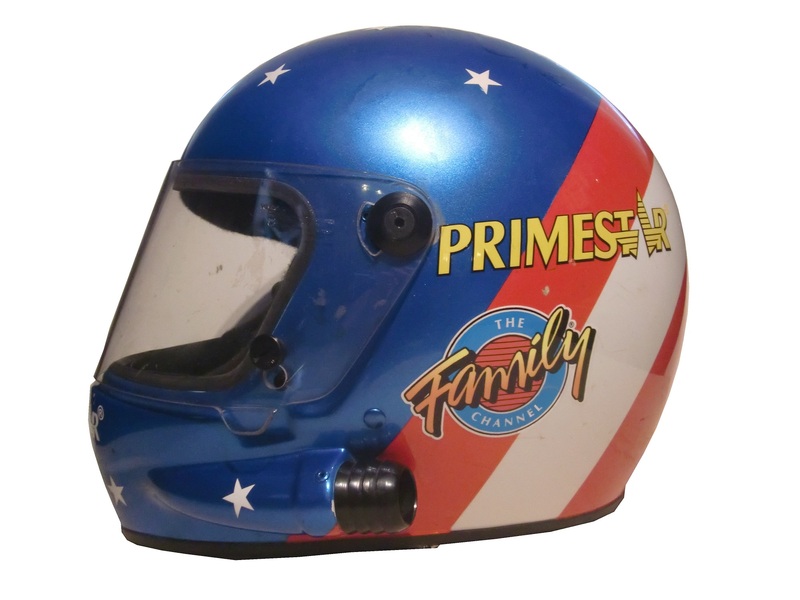 It was used in the Nationwide Series for Team Rensi Motorsports, founded by former McDonald’s Executive Sam Rensi. It carried a McDonald’s sponsorship. It was made by Impact! Race Products in Brownsburg, Indiana. Impact has a unique history. After Dale Earnhardt Sr.’s death in 2001, Bill Simpson, who had founded Simpson Race Products resigned after NASCAR had blamed Earnhardt’s death partially on a seat belt failure. He had a one year non-compete contract with Simpson, and after that expired, he went to found Impact. Because Bill Simpson was a race driver, he understood the needs of drivers, and both Simpson and Impact followed that philosophy. 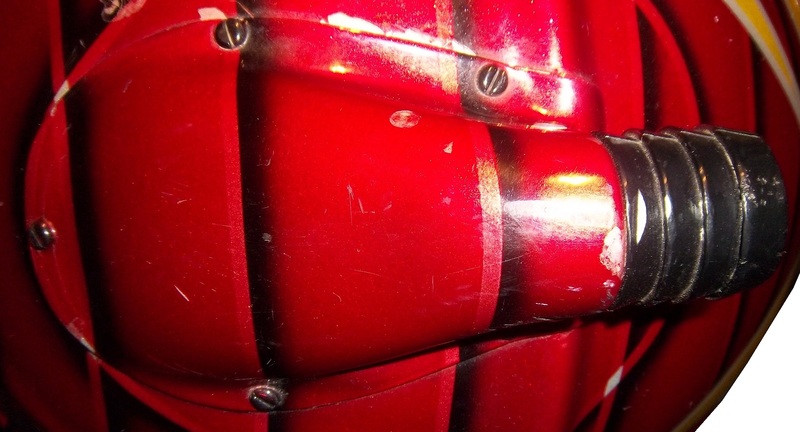 Let’s take a closer look at some of the features of this helmet. 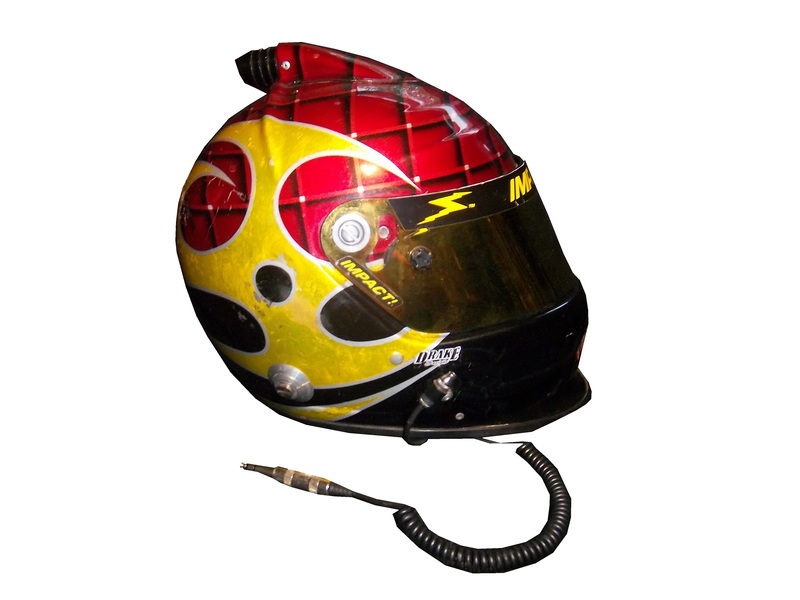 This is an Air Vapor helmet, used by a number of drivers on the NASCAR circuit. It is made out of a carbon composite material, which is both lightweight and very durable. It has been custom painted with McDonald’s colors and some very cool “ghost skulls.” The helmet has a number of unique curves, and grooves designed to help air flow around the helmet and keep the visor fog-free. 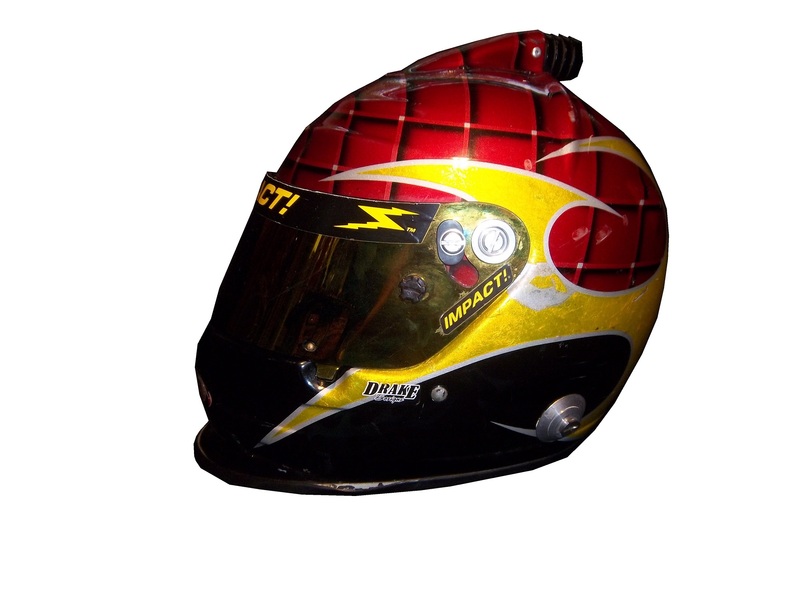 The visor is much narrower than older Simpson models, and the gold tint is shading for the visor. The Impact strip across the top does not obstruct the driver’s vision at all, as it covers the area of the visor over the opaque section of the helmet. The Microphone equipment is still present and in good condition. 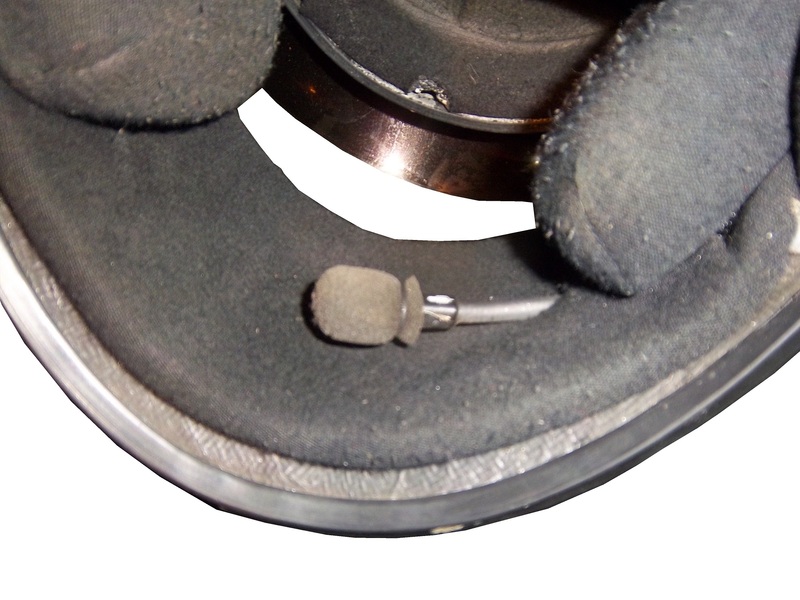 The microphone is one of the most critical safety features, as spotters are mandatory at every race, and they tell the driver everything going on around them. The driver can also tell the crew chief what, if anything, needs to be done to the car during pit stops. The telephone cord-style cable plugs into the seat, and the seat is connected to the electrical system in the car. Finally, the ventilation intake is located on the top of the helmet. This is connected to a hose, which in turn is connected to a “hot box” mounted in a window behind the driver. The hot box has a gas scrubber on it, which cleans up the air, and cools it before blowing it on the driver. Considering that the driver compartment can reach temperatures of over 160 degrees Fahrenheit, this is a critical piece of equipment. Older models, like this Ted Musgrave model from 1996, have the intake located on the side. 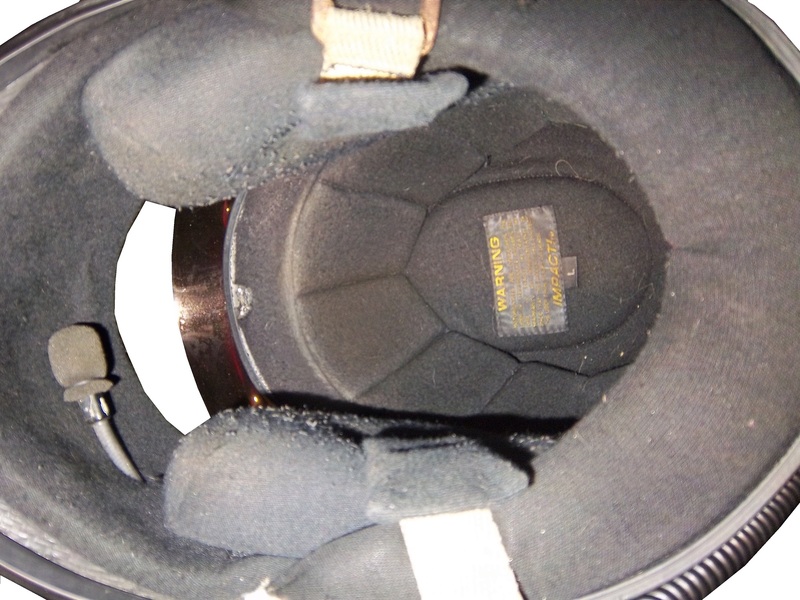 However, since the HANS device became mandatory, the intake has moved to the top to accommodate the device. Ryan Reed #16 Drive to Stop Diabetes Ford Mustang Good color scheme, red white and black is always a good choice, but the design on the side is confusing to look at. If the design next to the front wheels is removed, I could give it a better grade, but with that design it gets a C.
Steven Wallace #66 Richard Tocado Ford Mustang Great scheme…only way this could be any better is if the lettering, numbers and stripes were in gold, like Rusty’s 1990’s MGD scheme…A grade. Johanna Long #70 Foretravel Motor coaches Chevy Camaro A very solid scheme with a great color scheme, great design, and an A grade…very solid! Ricky Stenhouse Jr. #17 NOS Energy/Valvoline NextGen Ford Fusion I love this scheme. Orange and blue is a great scheme to work with, there is not a lot of needless design on the sides, the lettering and numbers look good. So this scheme gets an A. Ricky’s Valvoline NextGen scheme is the same as the Nationwide Series car Trevor Bayne drives, and it gets the same A grade. Terry Labonte #32 C&J Energy Sources Ford Fusion If there were no contingency decals present, I would think this is just a black and white picture. 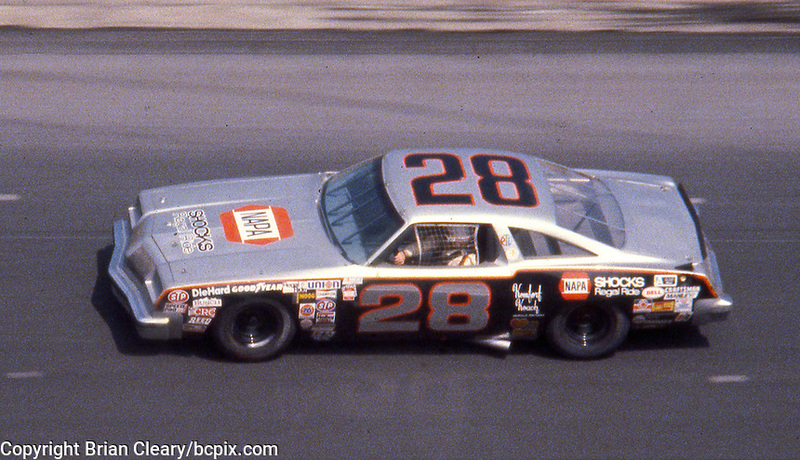 Silver is a great color for cars, and the black white and silver scheme works well in most applications, but this scheme just falls flat. Final Grade C-…just too meh to be good. Carl Edwards #99 Subway/Kelloggs Ford Fusion The green stripes look more like seaweed, and ruin what could have been a great scheme. The Kellogg’s/Cheez It’s scheme is way too cartoonish to be taken seriously, so both schemes get an F grade.